There are actually three types of tree that can be known by the term Redwood. The main one featured in these pages is the one known as the Giant Redwood, or Wellingtonia. Its true scientific name is Sequoiadendron giganteum . Next is the Coast Redwood, or Sequoia sempervirens. Third, is the Dawn Redwood, or Metasequoia glyptostroboides (a bit of a mouthful!) In many ways, quite different trees, but with some similarities in the first two at least. Let's take a look at them in more detail. 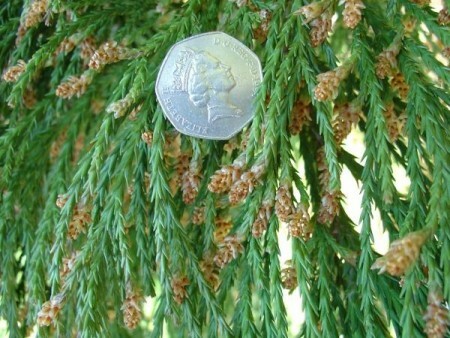 The Wellingtonia is the most massive of the three. In fact, they are recognised as being the most massive of all trees. Not quite the tallest and perhaps not necessarily the broadest, but certainly the heaviest. Although they were already known by the native inhabitants for many centuries, Europeans discovered them growing in the Sierra Nevada, their only known remaining habitat, in the early 1850's. They can live for more than three thousand years, and can reach a height of over 100 metres. The trunk of these trees is very stout, usually forming a single straight column, and with a marvellous tapering effect at the base. They are covered with a beautiful soft, spongy bark - so soft in fact that one can punch them quite hard and feel no pain. This bark can be pretty thick, well over two feet thick in the more mature examples. This gives the older trees a certain amount of protection from insects, but the main benefit is its fire retarding properties. Whereas a forest fire is pretty much a disaster for the majority of trees, it seems that the Giant Redwood will not just shrug off such events, they actually need them in order to prosper. Moderate fires will clear the ground of debris and competing plant life, and the rising heat dries and opens the ripe cones, shortly afterwards releasing many thousands of seeds onto the well-prepared ground below. The crowns of the mature tree will, in a forest environment, be a long way from the ground, thus protecting the branches and foliage from destruction in the fire. Ironically, man's intervention in this respect caused considerable damage in the early 20th century. Forest fires in the Redwood groves were often extinguished before they took hold, but over time this allowed too much flammable debris to build up so that in instances where the fire could not be controlled it became so intense that crown fires developed, with devastating results. For such an immense and hardy tree, its seedlings are remarkably less resilient than one would expect. They seem to need just the right conditions, and are quite slow to develop in their first six months or so. Foliage of the Giant Redwood. This picture was taken when the male "cones" were present. This picture shows young growth. The Japanese Cedar (Cryptomeria japonica) is a tree that can very easily be mistaken for a Giant Redwood, especially from a distance. Closer inspection shows a more open arrangement of the leaflets, giving a slightly more "twisted" effect to the overall look of the tree. Watch out for this "imposter"! 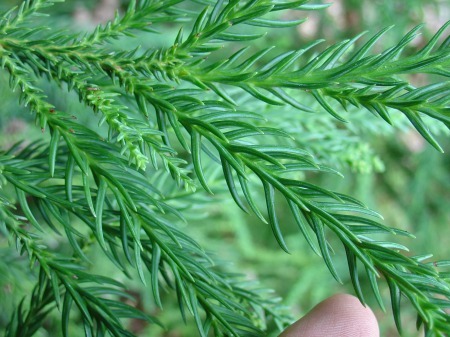 Foliage of the Japanese Cedar. This picture shows dried opened cones. The Coast Redwood, or Sequoia sempervirens, is usually referred to simply as the "Redwood". Although it does not grow as broad as the Giant Redwood, it does grow a little taller. It is in fact recognised as the tallest of trees, and many examples are currently measured at around 110 metres in their remaining native habitat of California. Some years ago, I understand that a group of people found a Douglas Fir which had grown to over 120 metres, but the fools only realised this when measuring it after having cut it down to make a flagpole (savages...). The bark of the Coast Redwood is similar to the Giant Redwood in that it is grows thick, and although relatively soft compared to most trees, it is a little firmer or harder. This affords it the same protection against fire as the Giant Redwood. Also, the trunk has a more parallel profile at the base, unlike the conical outward sweep of the Giant Redwood. 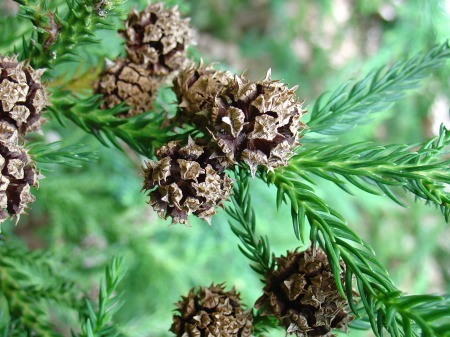 The leaves are very different, being flatter and softer and shaped rather like the Yew, unlike the short spiky leaves of the Giant Redwood. notice the alternately spaced needles. 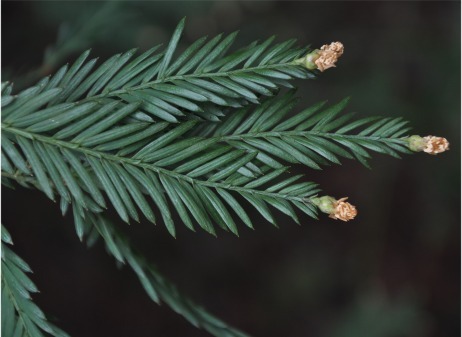 Foliage of the Coast Redwood, this picture shows young growth. It is not anywhere as massive as the Giant and Coast Redwood, but the Dawn Redwood is a bit of an oddity in other ways. Until the 1940's it was know only from fossil remains, as it had been thought extinct for many millions of years. Then, in a village in China, some living examples were located. Seeds were soon spread across the globe, and now, although relatively rare, they can be found in many parts of the world, including Britain. 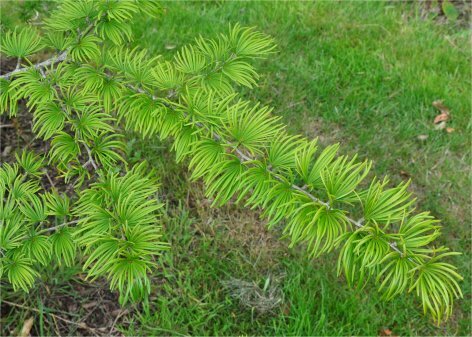 The Dawn Redwood has one other peculiarity, for although it is a conifer, it is deciduous. 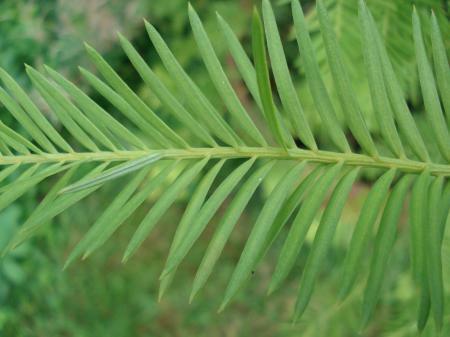 It has fine flattened leaves, much like the Coast Redwood but rather more delicate in appearance. Before they drop in the autumn they turn a bright orange colour - quite a spectacular sight, although the intensity of the colour can vary year by year depending on the weather conditions. The trunk is quite slender, and although very gnarled and furrowed near the base when mature, its overall profile is dramatically straight. The branches take a rather upward direction, and overall the tree forms quite a tidy conical shape. It likes plenty of water, and will grow happily in moderately swampy conditions. 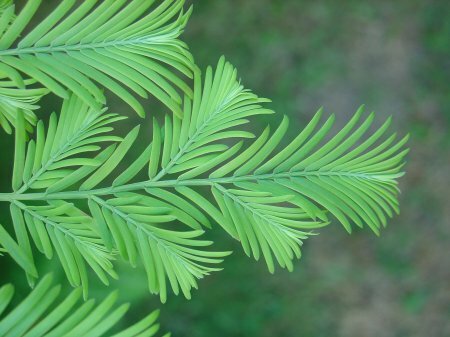 Foliage of the Dawn Redwood in July, notice the opposing needles. 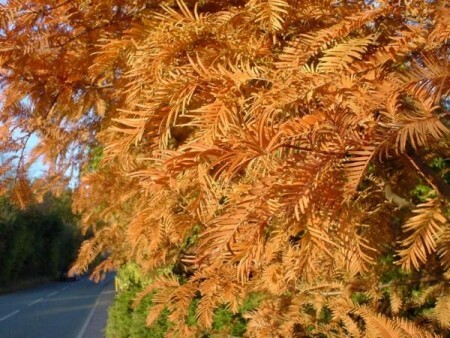 Dawn Redwood in the Autumn, when the leaves turn orange. 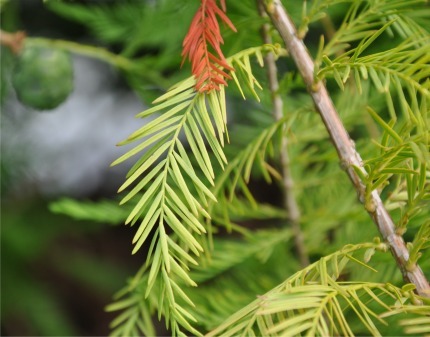 People often experience difficulty in identifying a Dawn Redwood as there are a number of similar looking trees such as Swamp Cypress (Taxodium distichum). One of the relatively unique features of this tree, however, is the arrangement of the very fine leaflets. On the Dawn Redwood they are arranged in an opposing layout (i.e. each pair seem to be attached at the same point of the stem), whereas with most other trees with this type of foliage they will be alternately spaced along the stem. The Larch (Larix decidua) can also be mistaken for a Dawn Redwood, this is usually in early spring when the tree starts to produce its tufty buds. 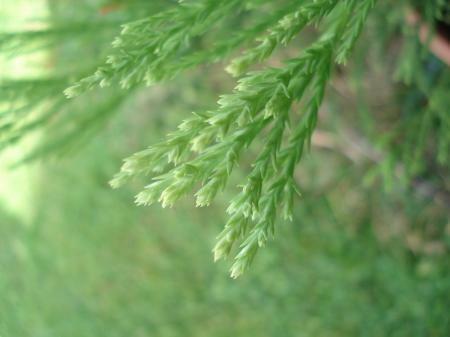 Foliage of the Swamp Cypress.